This year, Christine offered to knit an Icelandic style sweater of my own design for my birthday. 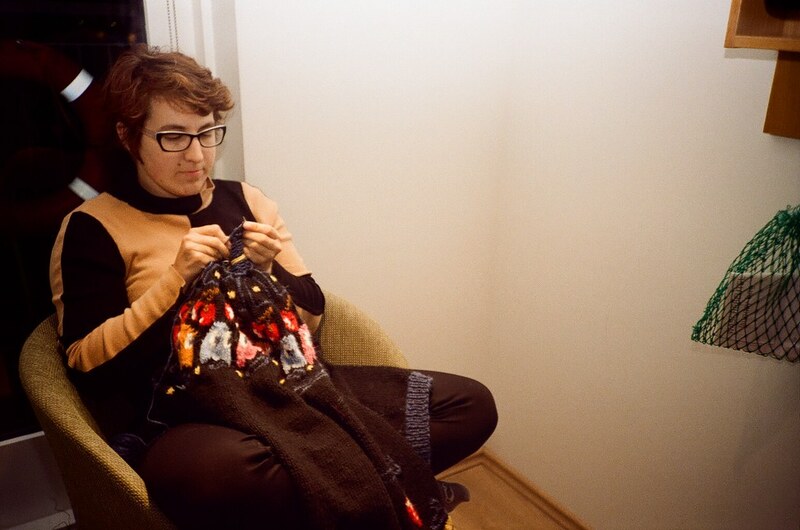 She had already made a few of these sweaters, also known as lopapeysas, before and said that if I designed something, she’d knit it. So of course I designed a Pac-Man Peysa using an online tool called KnittingPatterns.is. The sweater designer was a little buggy, especially on Mac, but it was surprisingly easy to get the hang of. The final Pac-Man sweater turned out great! You can read more about it on her blog post here. Since I’ve never knit before, I made a couple rookie mistakes in my design that Christine ended up editing to make it work better as a sweater. We’ve decided to share the final Pac-Man Peysa design as Creative Commons. You can copy it, modify it, or even sell it. If you like, you can give attribution to Christine Clarke and Doctor Popular. Here’s the file. To make it easier to edit, I’ve also uploaded the .prjon file here. You can simply go to design page at knittingpatterns.is, click the file tab on the top right, then click open and upload the pac man sweater.prjon file (you’ll need Silverlight installed). One suggestion I’d make is to avoid doing different color ghosts. It would be much easier to just pick one color and knit that. Maybe even do the dark blue ghost all the way around. I picked up this stylish fedora at a yard sale without realizing it was slightly too large for me. It got to the point where I’d check the weather to make sure it wasn’t going to be too windy for me to wear it. It turns out you can use foam tape to tighten a loose fitting hat. Bonus, you can use this foam tape to help keep enamel spins from spinning around too much.